With the British pound outpacing the U.S. dollar by slightly more than two to one, few Americans are psyched to make the hop across the pond these days. Though things are likely to get worse, keep your chin up. You can still find big city value in England if you skip London and head north to lesser-known Manchester. London might have been called the “The Big Smoke,” but Manchester owns a big piece of Industrial Revolution history, dating back to the 14th century when Flemish weavers came to produce linen and other textiles. By the 18th century, people knew it as “Cottonopolis.” While the smoke stacks have ceased pumping coal, the city has reinvented itself by converting its tattered remnants of industry into useful urban spaces and has erected enough cutting-edge buildings to lure architectural enthusiasts from all over. 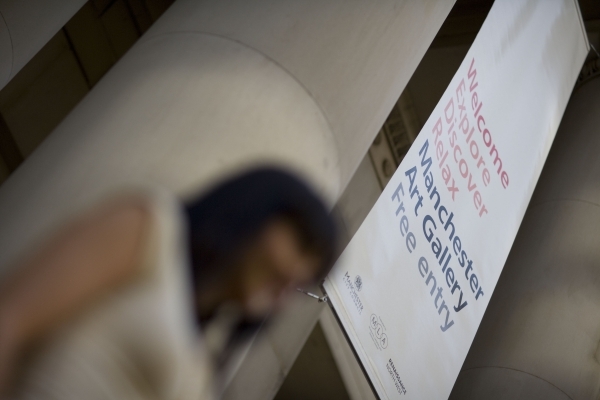 Those less in the know may just come to see Manchester United play football (soccer, to us Americans), but Manchester’s wealth of free museums, alongside reasonable hotel and dining options, prove that you won’t have to bend it—in terms of budget—like Beckham. Recent urban development has rendered Manchester the new cover girl of English arts and culture, but the prices aren’t en vogue. And when you need a break from museums, sporting and shopping activities will carry you through the day. Museums are completely free to the public. They include the Manchester Art Gallery, filled with works from English artists like the pre-Raphaelites and landscape painter J.M.W. Turner, and the Museum of Science and Industry, which catalogs the city’s industrial history from Victorian to modern times. Perhaps the most impressive of the bunch is the award-winning Imperial War Museum North, built by Daniel Libeskind, the architect who is designing the new World Trade Center in New York City. Inside its sleek, deconstructionist metal “shards” depicting a world shattered by war, several galleries chronicle the history of British wartime in the 20th and 21st centuries. Through January 6, 2008, The Animals’ War special exhibit tells the story through the eyes of our furred and feathered unsung heroes. Located along the once rundown Salford Quays (pronounced “keys”), the War Museum is one highlight among several architectural marvels. From either the museum’s viewing platform or the base of the Lowry Footbridge nearby, you can catch a glimpse of the steel-clad Lowry Arts Center set against the recently redeveloped Manchester Ship Canal. Though it’ll cost sports lovers between 25 and 44 quid to see Manchester United on match day, you can tour Old Trafford for only £10 (about $20 US dollars; see XE.com for current exchange rates). You might not experience the thrill of victory, but you’ll learn interesting facts about the stadium’s reconstruction after getting bombed in WWII, hang out in the players’ lounge and locker room, and of course, admire many odes to David Beckham’s success on plaques and trophies. You can shop until you drop in Manchester’s City Center, which combines the city’s past and present seamlessly. In the food market at Harvey Nichols’ department store, look out the window to see brick chimney tops and gothic cathedral spires mixing with towering demi-skyscrapers. This scene, plus Manchester’s version of the London Eye, seems anachronistic set around the medieval half-timbered frame of the Old Wellington Inn and Restaurant below. Here, great shopping stops include Selfridges “Foodhall” stocked with British and imported goods, the Triangle, and the Arndale mall. To counter the pricey pound, look for budget stores like T.K. Maxx along Market Street for all your trackies, trainers, and jumpers. Or, just watch the crowds go by in Exchange Square, which was reborn after an IRA bombing in 1996. For easy access to most of Manchester’s sights, it’s best to stay in one of the large hotels near the compact City Center. At the top sit the Radisson Edwardian, built on the site of the historical Free Trade Hall and the only five-star hotel in the city, and The Midland, a stylish “grand hotel” from the early 1900s where Rolls met with Royce. However, though cheaper than London’s most luxurious properties, the rooms still cost more than £100, closer to £200 in most cases. And while the services are superior to everything else in town, they’re not worth the extra money unless you’ve got some to spare. For an acceptable, more affordable experience, budget chains like Jurys Inns or Premier Inn are quite suitable. Plus, the locations are just as central as the luxe versions. Rooms at Premier Inn, part of Britain’s largest hotel chain, are stripped down but updated, clean, and modern. For properties in Manchester’s City Center, the hotel lists published rates at £62, compared to £91 at London’s Kensington location (the actual rate for a November stay was £131). Downtown Manchester may still be fighting the curse of not having a Michelin-starred restaurant, but its dining scene has received a makeover. For the occasional splurge, the trendy cuisine dubbed “Modern British” adds an upscale touch to traditional dishes. Think black pudding supercharged with Boddingtons ale batter and sarsaparilla apple chutney. But for those wanting to keep prices at bay, gastropubs, British public houses serving high-quality food, are your best bet. And while London’s average meal price is $72.25, according to a 2007 Zagat survey, Manchester’s prices are a bit more palatable overall. Sam’s Chop House (gastropub): At this landmark since 1872, go for the traditional fish and chips served with mushy peas (really just a pea puree) for £11.95. The portions are enormous so you won’t need appetizers. Albert’s Shed (Modern British): The specialty at this new restaurant in the Castlefield neighborhood is the oven roasted sea bass with sweet potato, thyme, and chili butter for £12.95, a nice complement to the baked king prawns starter for £6.50. Choice (Modern British): Choice comes recommended for its locally-sourced cuisine. Anything looks good on the two-course weekday menu for £12.95. Beluga (Modern British): All you need to know: sticky toffee pudding with a delicate scoop of clotted cream for £4.95. Though the live evening music makes this a great spot for dessert, the dinner prices are reasonable too. For cheap lunches, pick up a few of what I call “gas station sandwiches,” simple fillings layered between slices of bread cut diagonally and packed in plastic triangular boxes. Unlike many packaged lunches in the U.S., these actually taste fresh and can be found anywhere from gas stations and convenient stores to upscale department stores like Marks and Spencer. The best part is that they average about £2 each. Most of these eateries try to source their menus from farms within two-hour’s driving distance. You get the benefit of local flavor, literally, combined with traditional recipes and pretty good execution. Manchester airfare is similar to that of London, and flights to London are still among the cheapest to Europe. To search for flights and compare prices to Manchester, visit SmarterTravel.com’s price-comparison tool. If you’re not sold on Manchester yet, the city serves as a great jumping off point for day trips to places like Tatton Park, a stately mansion and farm a few miles away; the Roman city of Chester; and even Liverpool, which will be the European Capital of Culture for 2008. For country escapes, Manchester is only a short drive to Yorkshire Dales or the Lake District, which I hope to write about in a future column. For more information on the city, visit SmarterTravel.com’s Manchester Travel Guide.